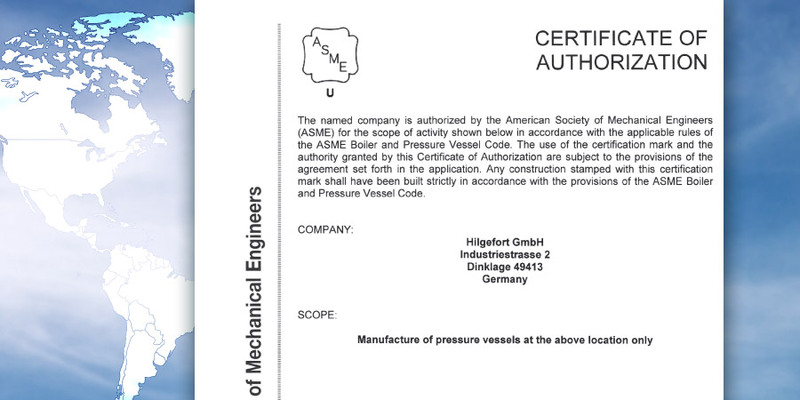 The ASME certification makes Hilgefort an attractive partner for US clients and global customers who need components with the ASME “U” or “S” stamp. The ASME “U” and “S” codes govern the requirements for manufacturer certification, quality assurance, design, material selection, production, inspection, testing, acceptance and certification of boilers and steam boilers, pipework and pressure vessels. ASME conducts unannounced checks for compliance with the guidelines once a year. Hilgefort GmbH is distinguished by its high level of flexibility and willingness to innovate. Since its foundation more than 160 years ago, the company’s core business has been the individual production of plant components. In order to satisfy the expectations of customers of industrial clients from a wide range of sectors, continuous investment has been made at Hilgefort. Components measuring up to 6.8 m in diameter and weighing up to 300 tons are produced on the factory’s 7.5-hectare premises. Customer service at Hilgefort means all-round care: From engineering requests through to international (door-to-door) delivery and on-site installation. Project Manager Thomas Kolbeck also states: “Plant construction is not for beginners. At Hilgefort, more than 200 projects are processed every year. We supply components such as pressure vessels, steam boilers, dryers, filters, pipework, rotary kilns, silos, shipbuilding parts and many more to the chemical and petrochemical, iron and steel, food and construction, mining and shipbuilding industries. Only a handful of German contractors have ASME certification for pressure vessels and steam boilers, which is why this accreditation is so important to Hilgefort GmbH and its international customers. Background: What exactly is ASME?